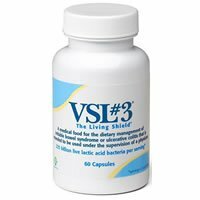 Overall, at 3 out of 5 stars, VSL#3 The Living Shield Probiotic is a slightly above average probiotic. I really like how unique this product is. It’s specifically designed for specific ailments such as Irritable Bowel Syndrome (IBS) and Ulcerative Colitis. This being said, VSL#3 is intended to be used under the supervision of a physician. There has also been a specific research study done with VSL#3 that showed promising results and alleviated gas and bloating symptoms from gastrointestinal conditions. As much as I love the fact that this product is meant specifically for special ailments, there are also many things that I don’t like. This probiotic is outrageously expensive. It costs about $65 after shipping and tax and can potentially only last you a week. You also have to take 2 to 8 capsules per day. This is a little overboard and I really favor the probiotics that only require 1-2 capsules daily. You also have to keep these capsules refrigerated at all times. This makes the probiotic not very stable. I’m always wary of if the company kept the probiotic refrigerated the entire time and during the shipping and packing process. One last thing is that this probiotic has a ridiculously high cell count – 112.5 billion cells (225 billion per recommended minimum serving). It’s very easy to think more is better but a cell count of this proportion can lead to some pretty severe side effects. One reason the cells might be so high is because many may die in the process if they aren’t kept at the proper 39-46° F temperature. Regardless, I think the cell count is too high and not necessary. Overall, at 3 out of 5 stars, VSL#3 The Living Shield Probiotic is a slightly above average probiotic because it’s incredibly unique and specifically designed for IBS and ulcerative colitis patients however it’s extremely expensive, needs to be refrigerated, and the excess of live cells can lead to painful side effects. VSL#3 The Living Shield Probiotic contains 112.5 billion cells in 8 probiotic strains. Of note, I like the use of Streptococcus thermophiles. This particular strain has been researched to show potential improvement in overall digestion and immune function. It may also help reduce diarrhea, ulcerative colitis symptoms, IBS symptoms, and respiratory infections. It’s important to note that this probiotic has an extremely high cell count. 112.5 billion cells per capsule is incredibly large and not typically necessary. This many cells can lead to harmful effects instead of positive ones such as increased side effects. This probiotic is also meant for use under the supervision of a doctor. VSL#3 doesn’t list any allergens on the product or on their website. The other ingredients include: lactic acid bacteria, microcrystalline cellulose, stearic acid, magnesium stearate, vegetable capsule (hydroxypropyl methycellulose), and silicon dioxide. For a 60 capsule bottle, lasting 1 week to 1 month, it costs $65.06. This works out to be $2.16 – $8.67 per day to take this probiotic. Usually anything over a $1.00 per day is considered fairly expensive. This probiotic is meant for a specific ailment and under the direction of a physician. With this being said, I think it’s a decent value but there are definitely better values out there for your money. I did get side effects when first taking this probiotic. I experienced belly pain for the first few days. This wasn’t fun, but thankfully it did go away. This probiotic is NOT for daily use or for the casual belly symptom. VSL#3 is specifically intended for IBS and Ulcerative Colitis. This is because the cell count is extremely high and you can expect to see some side effects, such as bloating and stomach cramps. VSL#3 doesn’t have any sort of guarantee or even a refund or return policy. The company explains that any product that is refrigerated (such as VSL#3) can’t be returned. The only way to get a refund is if there was an error on the company’s end. This probiotic is one of the most expensive I’ve seen so far. You’re also taking a chance that the cells could be dead by the time they reach you. To buy VSL#3 The Living Shield Probiotic, click here.